We visited a large number of providers across the country to establish an over view of the quality of provision. To do this we used the ECERS and ITERS scales as used in EPPSE along with a new scale called SSTEW that has a focus on early language and interactions. At this point in time the scale is confidential but will be published shortly. The visits were carried out by Action for Children and our Early Years consultants, working under the guidance of Professor Edward Melhuish from the University of Oxford. All our Early Years consultants were experts in their field so understood the work you do and the challenges you face every day! Our consultants spent a few hours in your setting undertaking observational work using the scales. We asked you not to prepare for our visit, as we wanted to see a normal day for you and the children, so the visit would not be judgmental or intrusive. The visits were not an inspection on quality, but rather a look at ECERS, ITERS and SSTEW as a quality assurance tool. The findings are completely confidential and your setting’s name have remained anonymous throughout. Childcare and early years providers needed to be involved in the research because we needed to know how different settings might affect children's outcomes. We visited the childcare and early education settings that are being used by the children taking part in SEED. 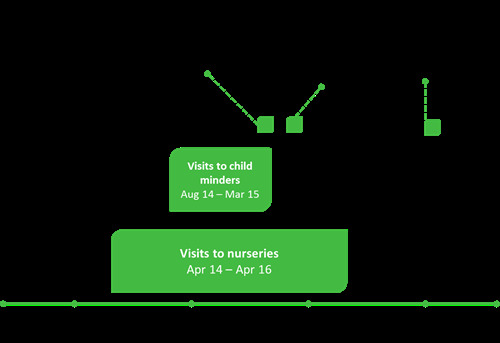 This helped us to link the final outcomes of the children to the type of early years education they received. Taking part wasn't mandatory but by taking part you did your bit to champion Early Years policy. The data collected by our consultants during their visit was analysed alongside the survey findings, and then integrated into the findings from the wider study. Your role in the study has remained anonymous throughout and and no report will identify you or your setting. Report due to be published in late 2017/early 2018.